Conspiracy theorists have always seriously creeped me out. Not because of what they're saying, necessarily, because I think most of the stuff they believe is pure rubbish. I'm not even that scared that what they're saying is true. What scares me is just how purely delusional one has to be to believe some of the things these people believe. 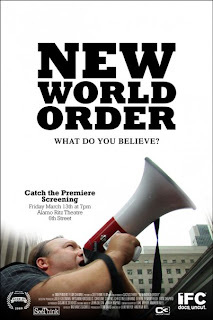 New World Order, the new documentary by Luke Meyer and Andrew Neil that is premiering at the South by Southwest Film Festival in Austin, Texas, examines the views of several conspiracy theorists and explores what led them to their current extreme views. The basic idea of the New World Order movement is the fear that there is a cabal of wealthy, important people who make up an organization called the Bilderberg Group, and together they make decisions that decide the fate of the rest of the world. World leaders must swear allegiance to this group before being allowed to take office, and they're all conspiring to bring about a one world government under their tyrannical thumb. A 9/11 Truth rally in New York City. Credit: Courtesy IFC. Who is this Bilderberg Group? Well apparently they meet in a secret location every year (but the people who are out to expose them always seem to know where they are), and have welcomed such guests as Bill Clinton and other notable US politicians. No one knows exactly who the members are, but Henry Kissinger is rumored to be among them, as well as representatives from all the other major world powers. Radio personality Alex Jones has made it his life's goal to expose the Bilderberg Group, and as something of a conspiracy theorist rock star, he essentially becomes the centerpiece of the film. Of course, when one talks about conspiracy theorists, one is referring to a giant umbrella. There are all kinds of conspiracy theorists and they don't all adhere to the same set of beliefs. 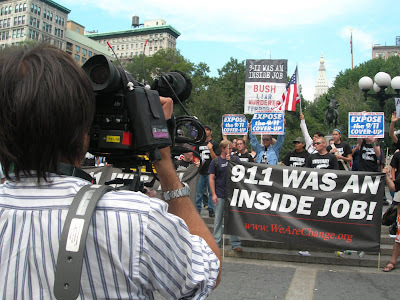 One of the major groups that the film profiles are "9/11 truth-ers," the people who believe that 9/11 was an inside job. For those of you who have ever seen the popular internet documentary, Loose Change (I've seen parts of it, but never had enough interest to watch it all the way through), you know basically what they're all about. New World Order aims to explore their beliefs in a neutral and objective fashion, neither condoning or condemning what they say, which in many ways is an admirable approach. The problem is, that by not taking a stance, the filmmakers effectively have given an extremely vocal fringe group a bully pulpit to shout from. They are never held accountable for what they say, even if it is just blatantly wrong. I know that's not the purpose of the film, but I couldn't help but wish for some more journalistic investigation on the behalf of the filmmakers. 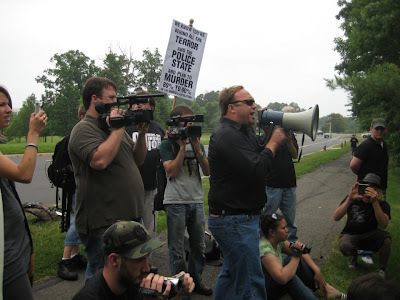 Alex Jones (center, with bullhorn) and others protesting the "New World Order." Credit: Courtesy IFC. Most people's reaction to the film will most likely depend on their feelings about conspiracy theories. To be honest, I was put off and unnerved by the film, but that doesn't mean it isn't compellingly made. To their credit, Meyer and Neil step back and allow their subjects to speak for themselves, but I always got the nagging sensation that with a subject like this, silence is just another form of agreement. The subjects guide the tone and direction of the film, and if they wanted a recruitment tool for their cause they may have found one in the form of New World Order. But in the end, I never felt that we had gained any new insight into why they believe what they do, most were recruited by propaganda tools like Loose Change. I would have liked to know more about where the theories came from and why so many people are so passionately behind them. For its part, it's appropriately disturbing and oddly compelling, but ultimately strangely underwhelming. I wanted more from it. It is possible to be even handed and still challenge the ideas being spewed forth. By just setting up a camera and letting the subjects guide the film, the filmmakers have essentially handed a fringe group an unfiltered microphone. One almost wonders why the Bilderberg Group allowed it to be made. NEW WORLD ORDER; Directed by Luke Meyer and Andrew Neil; Not Rated; World Premiere tonight, 7:00 PM, Friday March 13th - Alamo Ritz 1 in Austin, Texas. Additional screening 11:30 AM, Tuesday March 17th - Austin Convention Center. The film will debut on IFC Free in April. You should actually do some research before you call it rubbish. You can"t condemn something which you obviously haven't the slightest clue about. LOL! Thank you cowardly anonymous poster! You're a credit to your cause! Why are you in favor of the New World Order? Because I like the idea of a world government. You call it Rubbish, you call them crazy kooks, etc. You're IN FAVOR of a world government which I think you cant be that foolish - you're just trying to coax a knee-jerk reaction from "True Believers". You wanted "more" from it? What? You want to be taken out on a night time flight out of your bedroom window like Scrooge and see what the New World Order (Elite Cabal) have done to this planet? If I hear "conspiracy THEORY" one more time, I think I am going to VOMIT. Its not THEORY. Theory is just that - a theory. Everything Alex Jones has said is Documented. Now why don't you go researched DEPLETED URANIUM and go look at actual video (not pictures) of babies born with DU poisoning. You will lose your appetite for the next week - IF you have a soul and aren't desensitized by TV! IFC NWO is just a 0.0001% story of people who are after the greatest criminal syndicate the world has ever seen. People like Luke, Alex and McLamb are all VERY respectable people and they deserve more than a snicker from a stooge like yourself. I think it's hilarious how all these NWO comments are anonymous. First of all, if it's documented, show us. You're making mountains out of molehills. Secondly, namecalling will get you nowhere and one reason I don't have much respect for conspiracy theorist types. Thirdly, yes I am in favor of a one world socialist government. So sue me. I disagree with you about the stance of the filmmakers regarding the subject of the documentary. I think they are clearly anti-anti-globalists, and they brilliantly let those in the film speak for themselves. By film's end, I definitely was of the opinion the main players in the documentary were a bit on the looney side. For example, see the extended footage of Alex Jones completely ignoring a radio caller while going into character of a crooked cop. It sounds like the caller is trying to make some valid points in agreement with Alex, but all he can do is sit there and listen to the sound of his own voice in a very self-masturbatory way. Quite creepy. The filmmakers decision to allow this scene to go on much longer than it needed to shows their bias behind it. See also the New Orleans resident, who, when confronted by someone who was ACTUALLY AT THE PENTAGON, stumble over his words as he is basically owned on camera by a pentagon worker that had friends die in the incident. These little hints throughout the film that focus on the lunacy of it's subjects in mind gives the film a definite anti-conspiracy theorist slant. Yes, there were definitely moments in there like that, but to me that seemed part of the film's neutrality. By showing things like that, it kept the overall tone "fair and balanced" so to speak. I think if it had an anti-conspiracy theorist slant there would have been more of that and it would have been more obvious.